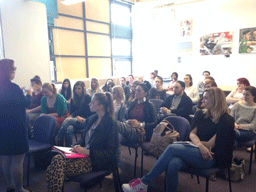 Guest speaker wows Fashion Marketing students! This afternoon at Accelerator we hosted our weekly Fashion Marketing program for students from London Met university. This meeting is going to be one to remember however, as the CEO of Sales Gossip came in to give a presentation! Zabetta Camilleri, CEO of Sales Gossip had the audience fully engaged today as she talked about how her business got to the point its at today. @SalesGossip all started from an idea that Zabetta had herself about what could make her life easier. She was a fan of certain brands of clothing, and thought about how much she would enjoy something that notified her whenever a new line or product came out. After doing a little research and street surveys, she found out that there really was no other service that was doing this and that the market was huge for a product like this so she began to create the app. What Sales Gossip does, is it pays attentions to the brands you like as a consumer, and will introduce you to other similar brands and where they are being sold. On top of that, it also notifies the user of any upcoming or current sales that are being held with their favorite brands. Huge companies have worked alongside Sales Gossip in order to tell buyers about their sales and are offering a pretty big price for it in attempts to increase sales. Many of the topics covered in her presentation were ones that the students had presented themselves via twitter prior to the meeting. She was reading them off one by one and answering them which was very informative for all involved. Marketing strategies, funding, business plans were all discussed as she gave a timeline of what she had to go through to make her business successful. Words of wisdom were frequent so notetakers were frantic. In front of a crowd of fashion marketing majors that all hope to one day make it to the point that Zabetta has reached, the insightful presentation had the audience inspired and motivated. As someone who wears the first article of clothing he sees in the morning, I was inspired to go out and be successful in the fashion industry, it was a truly amazing event.